Stopping in with today's 2nd post! Click HERE or scroll down for the DeNami Blog hop! I had some extra time last night so I though I would play along with the Monday Mojo sketch! This sketch may be one of my favorites EVER! I love it so much! This adorable patterned paper is from My Minds Eye! Its the Fly a Kite paper pad! I love those clouds so much that they are actually the wallpaper to my iPhone! So cute!! 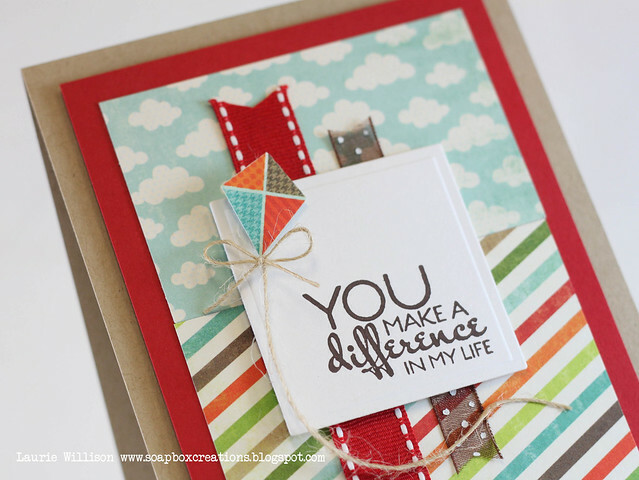 That GORGEOUS sentiment is from Verve's Bloom and Grow! Thanks for stopping again today! Don't miss my little announcement at the bottom of my DeNami post! :) Have a great Sunday! Super adorable..great job on the sketch! Lovely card and I agree - it's a great sketch! Lovely! I love this DP! Such a beautiful card! Love the bright and happy colors! Thanks for sharing! Way cute Laurie! Love your interpretation of the sketch! Great card! Love the kite! Love all the bright colours of this card and you've done a great job of the sketch - I must admit I'm to scared to try that sketch!! Love this Laurie! So cute. I couldn't do this sketch on the other side either! I love those papers and how you've cut one of the little kites out and used twine for the string! This is one of my favorite paper lines! Just adorable! Love the kite with the twine tail and your ribbons behind the sentiments. Very nice! This is so fun! I love that cute kite with the cloud background! And the sentiment is so fab too!! Oh, this is just fabulous! Love your take on the sketch and that kite is just perfection! Thanks for playing Mojo Monday! Super cute! 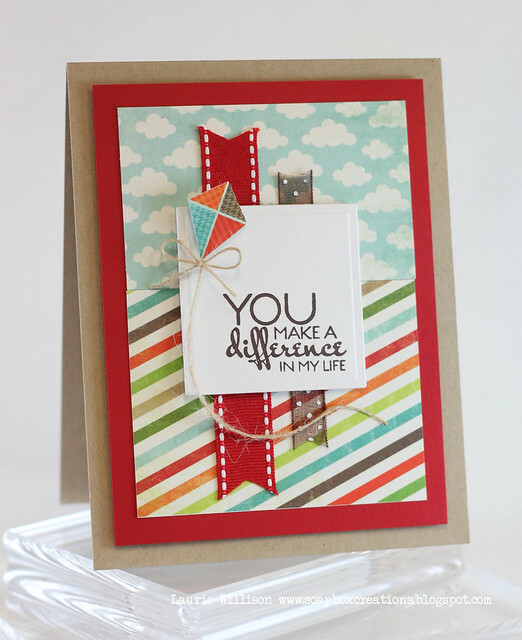 LOVE your combination of patterned papers! So crisp and playful and fun! Fun, fresh colors, fabulous DP and a kickin' take on the sketch! This rocks, as usual, Laurie!! !